This is part of a Blog Azeroth Shared Topic – check out other articles about this topic from great authors around the WoW blogging community! One of the very first things that anyone will do when they log into World of Warcraft on a new character will do is accept a quest. There’s a big shiny yellow exclamation point above a nearby NPC that draws you in and compels you to right-click them. Then, for whatever reason, if you kill enough pigs you’ll get a reward! How awesome is that? More often than not, it’s very awesome. Even moreso since the Cataclysm old world redesign, WoW’s quest design has been amazing. Not too long ago, I did an article about some of my favourite quests in the game. This time we’re going the opposite way, to some examples of the worst quests that are out there today. Not surprisingly, they mostly come from Outland and Northrend – but this is partly because I haven’t done all of the new content yet. The infamous random number generator (RNG) can be one of the best or worst things in the game. It is blamed for drops from mobs and bosses, block/parry/dodge/hit/miss chance, spawn rates, and quest item drops. There is a reason why the RNG is hated so much, and it’s because of the simple fact that it’s so very random. Any quest that does not have a 100% chance to drop your item has the possibility to require you to spend an unhealthy amount of time trying to get what is required. Lately it seems that the drop rates for many quests have been improved, but there are many that are still very annoying. Good examples are in Zul’Drak, the quests to collect bat wings and spider ichor. Isn’t killing a BAD thing? Falling in line with the RNG is the “kill mobs until something happens” style. Apparently the leaders or commanders of certain groups of mobs only appear after a certain amount of people die. It makes me very glad that I don’t serve under them. Three examples that came to mind immediately are all from Northrend. In Howling Fjord, you have to kill a number of Vrykul until the commanders show up for you to impale with a battle standard. In Zul’Drak, shortly after going to Zim’torga, many trolls need to die in order for certain mobs to show up and take their shinies. I just did this quest again yesterday, and it took way more time than it should have. This post could not happen without some mention of the poop quests. First appearing in Burning Crusade, there has been some sort of quest like this in random places since. To this day, my wife won’t do the Hellfire Peninsula one. 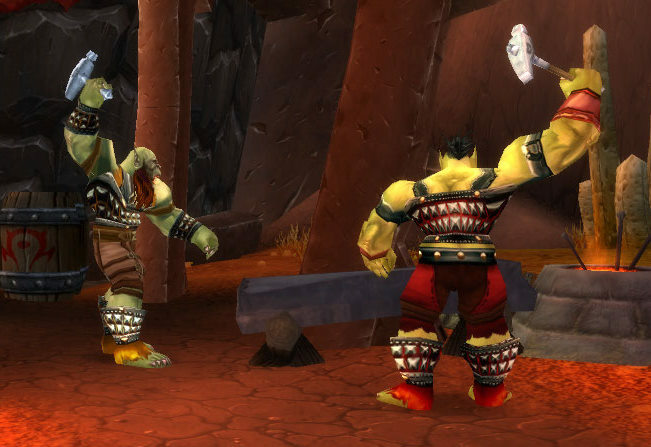 The above-noted quest is called Shizz Work, and is given by a goblin foreman near Thrallmar. Part of a quest chain and open to both factions, it involves using a flute to summon a felhunter and digging through its “leavings” to find some keys. After digging through each pile, you get a debuff called “Stanky” that doesn’t do anything but give you a green smelly aura. Good idea, but enough already! Once Blizzard finds a quest mechanic that they like, they tend to stick with it. Sometimes a bit too much, at times. There are quests where it’s a fun mechanic, such as taking an abomination and blowing things up with it, but the amount of things required to blow up is a bit much. A good example of this is the a quest in Zul’Drak for Drakuru to require a total of 60 trolls to be killed to draw out the three chieftains. I really enjoy things exploding, but it could have easily be done in half the amount of trolls and have the chieftains come with every 10 instead of every 20. Thankfully there is a good variety of types of quests in the game. Blizzard has done a great job, especially in the new Azeroth, of mixing things up. I hope that eventually we’ll see a revamp of Outland and Northrend, and with that we can see some of the new mechanics introduced to these areas. This is part of a Shared Topic, started by Akabeko of Red Cow Rise. Make sure to check out more great posts from other Blog Azeroth authors! What defines a person? What is the thing that is at their core, which makes them who they are? There can be many things that do this, which can be small or large parts of their lives. As a gamer, we have a way to extend these definitions of ourselves into the virtual world through the characters we play. Of course, not everyone does this. There are people who play only for the enjoyment of what a certain character can do or a role that is required. I believe that someone who truly enjoys playing a certain character does so because it’s something they can identify with. Looking back at the characters I’ve played over the years, I can see a progression of how I identified with these characters and why I chose what I did. 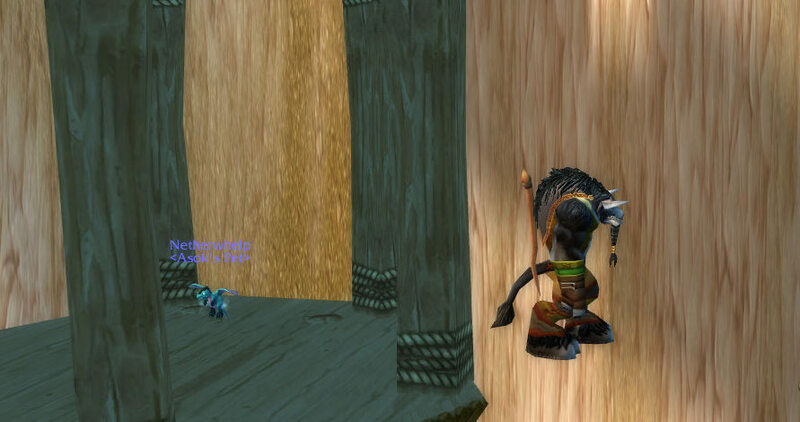 More so, I can see why I’ve stuck with my Tauren Druid so long and still really enjoy playing him. Of my many characters, I’m only going to focus on two: my previous main, a Blood Elf Paladin and my current main, a Tauren Druid. I stuck with my Paladin for a long time, starting on BC launch day and raiding as a healer through Tier 5 stuff (Serpentshrine Cavern and Tempest Keep). This was my first experience playing a melee oriented class that I actually enjoyed, as previously I had played only ranged/magic classes in my online gaming career. With this character, I found that I could identify with him somewhat. In real life, I’m a very ordinary guy. I work for a living, I have a great family, I do very normal stuff. However, part of what I do in my job is help people out (since I work for a bank, it just happens to be financial help), and that is part of who I am. When I focused on being a healer and a paladin, I could identify with what the paladin is supposed to be. A protector of others, putting other people ahead of one’s self. As I was healing my guildmates and keeping them alive through these encounters, I could see myself in that role as well. Because of this, I believe that I stayed with the character for a while. The Paladin was a member of the Blood Knights, originally siphoning power from M’uru, and thinking that he was just doing this for his own advancement. Yet, as time went on he realized that he actually liked being able to help others out. Rather than just being another Blood Elf minion, he established himself as a member of his guild and a vital member of a raiding team. When he found out about the betrayal of Prince Kael’thas, he decided to focus on the friends he had made in his guild and only be loosely affiliated with the Blood Knights, even though the Sunwell was restored. My current main character was born because my wife had recently started playing WoW as well, and we wanted to level characters together. She had created a Tauren Shaman, and I wanted to create a new Druid – hoping that it was better than the original time I tried to level one in Vanilla. We had a lot of fun, and made it to max level in Burning Crusade, and I eventually made him my new main. I see my Druid’s identity as part of that original experience. He was going through the world with his wife, trying to help people out and bring glory to the Horde. His loyalty is first to his family, then to his fellow Tauren, then the Horde. This is basically how I am in my real life situation. Our experiences shape who we are, in-game and out. Whether that is a traumatic experience that makes you cringe when you see spiders, or a smile whenever you see kittens because you just love them. If you value protecting others by keeping them safe, a healer or tank might be a good option for you because it aligns with natural personality. If you protect others by removing things that would cause others harm, there’s DPS for you. What type of DPS? Take out your frustration by stabbing things as a rogue. Enjoy setting things on fire as a warlock. WoW’s longevity can be credited to a number of things, and I believe that relatable characters is a very big part. I wrote about this before regarding NPCs, but this definitely also applies to player-controlled characters as well. Why have a hero if you hate being that person? 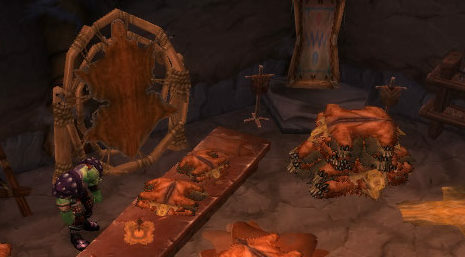 While browsing through Blog Azeroth not too long ago, a former Shared Topic caught my eye. Titled “What has WoW taught you?”, I realized that there have been a number of things that I’ve learned in my time playing World of Warcraft (as well as other online games). Thinking about it, I’m reminded once again how certain positions in online games warrant being mentioned on resumes. If anyone has ever been a guild leader, guild officer, or raid leader, they’ll know that this is very true. Managing people is a very difficult task on any level, and something that may have been thought as small and insubstantial can easily turn out to be the opposite. Raid organizers from Vanilla will probably shudder a little bit, as filling 40 raid slots while maintaining optimal balance was extremely difficult. As soon as people start voicing their opinions, or certain people want certain things while other people want other things – managing this and keeping cool is an incredibly important skill to have in any situation. Companies can have seminars and courses specifically on people management. Consider your WoW experience as the preliminary stages. So much to do, so little time to do it. I’d say a large majority of people have a set amount of time to play WoW. Whether that time is two hours after the kids are in bed or all day because you have nothing better to do, there is still a limited number of minutes to do what you want. Figuring out what to do in the ideal order can help organize things much more efficiently. If you have certain daily quests to do, it might be better to start out with certain ones first because you’ll need to use your hearthstone to get out of there. After that, the other areas where you do the next sets of dailies might have a portal to go back to your capital city, so the cooldown on your hearthstone isn’t as big of a deal. Every job that is out there requires some sort of time management. The average job has an eight-hour day, and there’s certain things that need to be accomplished in those hours. By prioritizing certain things, it can increase productivity and make life a lot easier. Before I played my first MMORPG, my typing was horrible. I was the typical “hunt-and-peck” person, and I hated the “home row” style that was trying to be forced upon me at school. The game I played at first had a focus on role-playing and required quick responses with good grammar. In not much time I was able to increase my words per minute and the quality and accuracy of what I was typing. Any data entry or administrative job requires this. There may even be jobs that have a typing test as part of the interview process, and even getting the job could rest on these skills. Fortunately online gaming makes practice enjoyable. The person who likes to collect things must possess a lot of patience. Whether you’re a hunter camping a rare spawn to tame or waiting for the Time-Lost Proto-Drake to spawn so you can get the mount, there will be a lot of down time. Learning to be patient is a very important thing, or else it’s very easy to go a little bit crazy. Anyone who has ever worked in customer service has good experience with this. You’re ringing through their order, and they take forever to count out the change in their wallet while there’s a long lineup behind them, all tapping their feet. There are times where you just have to take a deep breath and go with it. Crap happens, deal with it. Very few things ever go according to plan, and it’s essential to be flexible and work with what life gives you. The perfect raid composition can still end up being a bad experience because people may not know the fight, people might disconnect, among other things. Just roll with it, keep on keeping on, and all those other phrases. Life is full of surprises, and there’s nothing we can do about it. If an urgent file is dropped on your desk with 15 minutes to go before you leave, we have to deal with it one way or another. How you deal with it, however, is up to you. If you’re the leader of a level 25 guild and have been running things for a while, I think that it would be a great thing to put on a resume. Everything that I just mentioned are very real skills that can be transferred over to any life situation. Hopefully one day employers will realize this. Who says geeks don’t know how life works? This is part of a Blog Azeroth Shared Topic. Of all the time sinks in World of Warcraft, there remains one that is not only a way to spend lots of time, but also lots of currency as well. People will debate until the end of WoW which is the best, which is the worst, which is the most boring, which is the most fun… which I will give my thoughts as well. I speak of our friends, professions. There are a good variety of professions, as well as opinions about them. My main character is currently maxed in all of his professions except for archaeology, having: skinning, leatherworking, cooking, fishing, and first aid. Altogether, I have personally found these skills to not be too bad to skill up with, having decent rewards. Going from a pure min/max perspective, they’re not the best ones, but it comes to the laziness factor in certain things. Here are my thoughts on professions in these categories: best, worst, most boring, and most fun. For this purpose, I’ll be defining “best” as looking at it from min/max standpoint, “worst” being the least beneficial, with “most boring” and “most fun” being self-explanatory. Best profession: my thought for this is jewelcrafting. There are a great amount of benefits from this, mainly being the jewelcrafting-specific gems that have the bigger bonuses, as well as the bind-on-pickup trinkets that can be used to supplement them. These, along with the incredible resale value of the products made, make a very attractive profession to get. I find that it’s rough to get the skill up to around 300, but after that it gets much easier (or so I’m told, my highest JC is only around 150). Worst profession: to me, this one is first aid. In the grand scheme of things, a bandage will do very little to help out in a battle. On my characters that have no way to heal themselves except through food and bandages, I still have found myself to rarely ever use bandages. If I’m in combat, I’m being damaged enough that the channeling will be interrupted easily, and if I’m out of combat I have food to heal me more efficiently. I’m maxed in first aid, but this is mainly for the achievements and nothing else. Most boring: this is a no-brainer, of course it’s fishing. Though there is a great amount of benefits from cooking the fish you get, it doesn’t stop the skill from being tremendously boring. If it wasn’t for the daily quests, I doubt that I would have it maxed yet. The introduction of getting a skillup when completing the Orgrimmar (or Stormwind) dailies made this profession bearable. I’ve tried to watch movies, TV, read books, many other things while fishing to break up the monotony, but I’ve yet to find something that works. A close second to fishing, however, is mining. It’s almost a requirement for certain other ones, and if you choose double gathering for your professions you’ll be able to make good amounts of cash. Yet, if you choose it along with one of the other professions that needs the smelted bars (blacksmithing, engineering, jewelcrafting) you have to go out and mine the ore, then wait for your character to smelt it. When you’re smelting hundreds of bars, you might as well go make a sandwich. Most fun: it seems that many people have this same thought, which is engineering. In all honesty, how can a profession that allows you to create explosive sheep not be fun? One downside to this one is the amount of materials that are required to make certain items can sometimes get quite exorbitant. The rewards, however, are worth it – I remember back in Vanilla, many paladins would pick up engineering for the trinkets so they had something ranged. There are mounts like the flying machines and mechano-hog, the various types of engineers’ goggles, and now the cogwheel sockets for engineer-only stuff… among many other really neat things that can be made. It’s one of the professions that I have never maxed, but is high on my list of wanting to do. The runner-up for this would be alchemy, out of sheer usefulness. Being able to make your own potions and elixirs is a huge benefit for any sort of use, whether it’s in PvE or PvP. There are the alchemists’ stones which are a great addition for any up-and-coming player, and the fun things like pygmy oil which will shrink you and eventually turn you into a sand gnome. Then there’s the pinnacle of them all, the Vial of the Sands – who doesn’t want to turn into a dragon? Blizzard has done a great job of giving us a choice for things to waste time in. They created WoW in the first place, why not create something inside it to make it even more of a time waster?